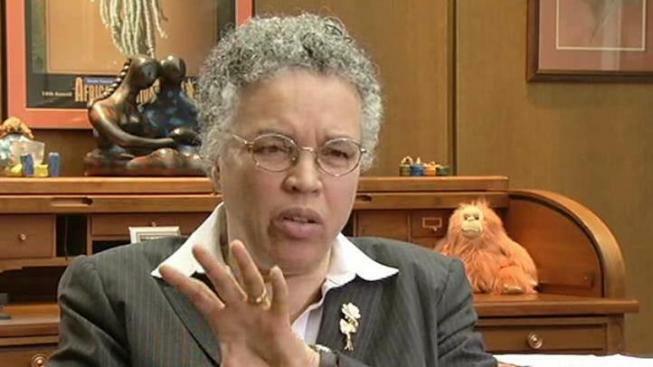 Preckwinkle: Project Shield a "Troublesome Issue"
"I can’t commit to you that every dollar was spent well,” new Cook County Board President Toni Preckwinkle says when asked about the controversial federal Homeland Security program, Project Shield. “This is one of many troublesome issues that we inherited,” she said during an interview in her office at 69 West Washington. Under the administration of past President Todd Stroger more than $45-million in federal Homeland Security funds were allocated to Cook County’s Project Shield. The initiative, dating back to 2004, was designed to equip suburban police cars with state of the art video cameras throughout the county. The cameras were supposed to provide a live look when first responders arrived at an emergency. Fixed cameras were to be mounted in suburbs as well. Earlier this year federal auditors, at the direction of Congressman Mike Quigley and Senator Mark Kirk, began going over the county’s ledgers. Auditors, we reported in February, called in the FBI. Where we are is an incomplete network, with just 85 of the 128 suburbs in Cook County using Project Shield cameras in their squad cars. Dan Coughlin, the county employee who oversaw the federal grants, was fired in February, as well as others in the county ‘s Department of Homeland Security. "There is some reason to believe there are investigations of their conduct,” Preckwinkle said. Still on the job at the County is Dudley Donnelson, a Deputy Director, who according to a federal lawsuit had a business relationship with a contractor who got Project Shield funds. Donnelson at the time, according to County documents, had authority over how some of the grants were dispersed. Donnelson said by phone he is no longer associated with Project Shield but directed questions to Preckwinkle’s office. Some suburbs, like River Forest, dropped out of Project Shield early on when the cameras, originally installed under a contract with IBM, didn’t work properly. Now Village officials, at their own expense, have installed 10 pole-mounted cameras, at a cost of $350,000. Currently there are no plans to incorporate Project Shield. Bob King, the new acting director of homeland security for Cook County, said he as heard consistent complaints from police chiefs about their frustrations. But he also said the county is committed to the concept. "The tool is here, right now it needs to be refocused,” King said. Which is the job of Greg Wass, the county’s new chief information officer. When asked if he thought the money was well spent, Wass replied, "I don’t think we’d spend the money the same way today."